This monitoring is aimed to demonstrate the working and leisure conditions of people in the fields, which in most of the cases are far from minimal: involuntary workers (men and women, healthy and sick, old and young) lack drinking water, food, hygiene and medical care. Considering this as well as simply the fact that picking cotton is a hard physical work, the vast majority of state-employed people for whom cotton harvesting is a must at risk of losing a job, prefer to hire people to go to the field instead of them. Since this year private entrepreneurs are also forced to pick cotton or otherwise hire somebody. Market merchants, owners of shops and cafes pay out of their own pockets and complain why they must do it if they have no business with cotton at all. The monitoring has been carried out by several people working in different governmental sectors in two regions of Turkmenistan: Lebap and Dashoguz. All of the people reported about what they have experienced themselves. A number of photographs from this cotton harvest campaign are available on ATN’s Facebook page. It is the height of the cotton harvest campaign in Turkmenistan. 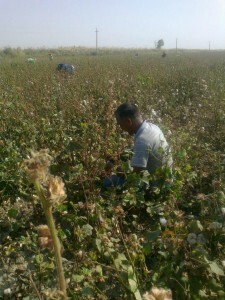 In the Lebap and Dashoguz regions, in addition to employees of the public sector, private entrepreneurs who lease land or premises from the state are also recruited for cotton harvesting. Private entrepreneurs are required to harvest cotton four days per week. In the Lebap region, employees of the sanitation and taxation services force owners of private cafes, shops and owners of other businesses (hair salons, radio and television repair shops, cobbler shops, etc.) to allocate personnel to go out to the fields. No one dares to disagree, as refusal would result in the shutdown of the business. 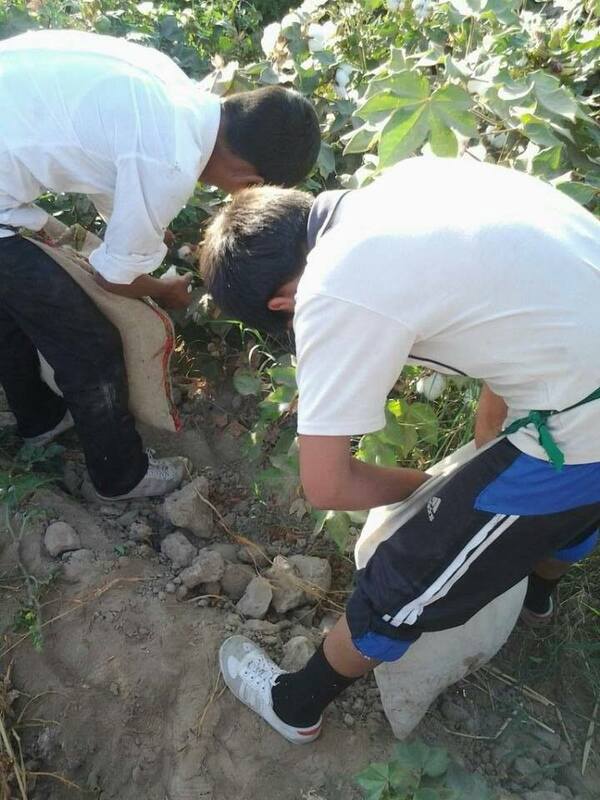 There is information that in the countryside of the Lebab region, 8-10th grade students are mobilized for the cotton harvest, particularly in the Bashyylyk, Astana-baba, Gyzylbaydak, Tyazeguych and Chiker townships. Children are taken to the nearby cotton fields on days when gym classes are scheduled. Conscripts were also noticed in the Hatap township’s cotton fields in the Lebap region. In the first part of the report we mentioned that every day 25-30 people are taken from schools to harvest cotton. Teachers are scheduled to go twice a week. The staff (cleaners, watchmen) go out more often — usually 4 times per week. Sundays are mass exodus days; everyone without exception is recruited: the young, retired, pregnant women (up to 20 weeks of pregnancy), those with allergies and the disabled. Nursing mothers are the only exception to the rule. 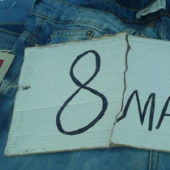 If one is unable to go, a daily payment of 10 manat ($3.5) is collected, covering a substitute worker’s hire and transportation. If one is required to go for several days with overnight stay but does not want to go, a daily payment of 15 manat ($5.2) is collected from him. One of the employees of the Dashoguz regional bank was hospitalized and had a surgery, but he was still charged a daily fee covering a substitute worker’s hire for the entire duration of his hospitalization. Most people who have families and children prefer to pay money, rather than work in the fields from morning till evening, thus the majority of those working on the cotton fields are hired substitute workers. It is a rule that if one hires substitute workers instead of going to the field himself, he or she needs to be present at his workplace: at school for teachers, in the hospital for doctors, etc. Corruption exists in matters concerning hired workers’ pay. The heads of all establishments appoint foremen who collect money from those not willing to harvest cotton themselves. 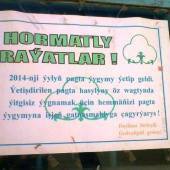 For example, in schools and medical establishments of the Lebap and Dashoguz regions, foremen collect 10 manat from employees, while the hired workers actually receive only 6 manat. The rest of the money is used for purchasing of certificates which state the inflated amount of cotton collected (in cases when workers do not fulfill the 50kg per day cotton collection norm) and part is shared by the foreman and his supervisor. This practice is now commonplace. 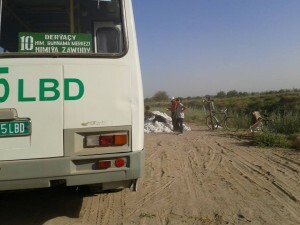 Ambulance drivers of the Dashoguz region have paid for the entire month work of labor by the substitute hired workers in advance, each giving 40 manat ($14) to the foreman. Protests do occasionally occur. Sources from the Mary region state that in the cities of Bayramali and Mary, teachers have refused to go cotton harvesting as well as to pay for workers to replace them. 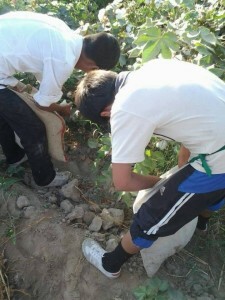 The teachers argued that those who planted the cotton should be responsible for harvesting it too. There were also a handful of teachers in Lebap region who shared this opinion. The overwhelming majority of the teachers, however, do pay, only expressing their discontent at the fact that they are expected to be present in the classroom and in the cotton fields simultaneously. Although they are paying for substitute workers to go out to the fields, they are still expected to be present at work. School principals of the Lebap region hold regular meetings during which teachers are told that they are going to harvest cotton voluntarily, based on their personal desire to help the state. Teachers are strictly forbidden to reveal that they are being forced to go out to the fields. Those who refuse to work in the fields or pay are punished by a reduction of their work hours, which leads to a decrease in the take-home salary. Additionally, teachers are often threatened to be replaced at their workplace. Such pressures are particularly felt by teachers of non-Turkmen ethnicity; always the first ones to be fired, they strictly follow orders of the higher authorities. In other state institutions, sanctions for evaders vary, ranging from severe reprimands, pay cuts to employment termination and issuance of negative recommendation letters, sabotaging any potential future employment. In the city of Atamurat, two kindergarten workers were fired after they secretly fled from the cotton fields. All of the abovementioned sanctions do not apply to the “special untouchable” employees with connections, such as relatives or mistresses of certain high ranking officials like the head officials of departments in the ministry of education, town counsel, prosecutors’ office or the police. Every state institution has such “untouchable” employees, who do not participate in the cotton harvest and yet also do not go to work. Such individuals, when working in schools, negatively impact the learning process, as their classes are often cancelled or substituted for with others. Students in higher grades usually have 3-4 classes daily, however there are instances when students are sent home after only 1 or 2 classes. Complaints from parents are frequent, because children left unattended at school often get into fights, get injured and damage the school’s property. Considering the high statements made about the reform of the national education system, the need for transition to international standards, such as the 12-year education system, the cotton campaign’s mobilization of teachers has not improved the current situation in education. This is true despite the fact that students are no longer massively recruited for the cotton harvest. Additionally, the numerous public holidays, concerts and other public events interfere with obtaining a rigorous secondary education, because the students and the teachers are always present as audiences during these events. At the moment, the preparation for the Independence Day celebration (October 27) is going full force. Rehearsals at the “Zahmet” stadium in Turkmenabat take place every day, with all of the dancers, musicians and athletes participating. All students, starting with 6th graders are taken from school to participate in the crowd scenes during filming. On Sundays, teachers take male students to the racetracks, which are televised and therefore require that there are audiences in the stadium. Teachers and students of the second shift are taken to the square in front of the “Rukhiyet” palace, where the filming of a competition of young singers “Yanlan diyarym” takes place. On Friday, October 4th, students of 7th-10th grades were taken from school for the filming of the Independence Day celebration at the main city stadium to stand in for audiences. Prior to the actual filming there were also several rehearsals. Besides the mandatory participation at such events, the schools in Labap region have been closed for several months because of the jaundice epidemics, thus cumulatively students miss a lot of school days. The doctors of the Emergency Hospital in the Dashoguz region complain that the shortage of personnel means they are each doing double amount of work. They especially feel the absence of men, who were sent to the cotton fields for ten straight days with overnights. There is constant exchange of staff between ambulance teams, especially at moments when a particular situation requires the presence of a male medical assistant (especially for the psycho-neurologic team) and all the male staff are out in the fields. Out of 15 teams that are usually servicing the area, only 8 are currently working, which means that the ambulance does not arrive in time (the arrival time of an ambulance should be no more than 4 minutes after the call was made). The lines are also long in clinics and laboratories. The Turkmen section of Radio Free Europe (RFE/RL) gives an example of a hospital in the Serdarabat region, where the department of infectious diseases is understaffed with some of the nurses, all paramedics and cleaning personnel gone to the fields; the remaining staff cannot keep up with work. Three of seven laboratory employees are sent to pick cotton, which has created huge lines of patients waiting for laboratory results. Municipal services are completely paralyzed for the duration of the cotton harvest. There is no one to clean the streets and the territory inside residential neighborhoods; the garbage is not taken out in time, which leads to unsanitary conditions and negatively impacts the already poor ecological situation in the country. Furthermore, the average citizens, such as the retired, cannot address their concerns or questions to their municipalities, receive documentation proving residency, pay for the utilities, etc. because all lower-ranking municipal employees, accountants and other staff have been sent to the fields; no one remains working at their regular positions. No one is there to be on-call in cases of technical service disruptions; all the specialists, such as the electricians, plumbers, welders, etc. have been sent out for long periods of time with overnights. The correspondent of Radio Azatlyk (RFE/RL), Osman Hallyev, tells of a tragic accident that took place on August 27 in Garashsyzlyk region. A 17-year old boy went to the cotton fields instead of his father; while there, he decided to take a swim in the river and drowned. It has now been more than a month since he has drowned, but his body has not been recovered yet. Just as was true last year, this year again safety measures were not met; people are being transported inside unequipped trucks, sometimes even inside dump bodies. This leads to tragedies, one of which has occurred in one of the Eastern parts of the Lebap region. The RFE/RL reporter tells that it is impossible to find out where exactly the accident happened; the authorities desperately try to hide all the facts related to such incidents. According to our monitors, the tragedy took place in the Atamurat village (former Kerki). An unequipped “ZIL” truck that was transporting 30 people fell into a river, which lead to deaths of three young women. 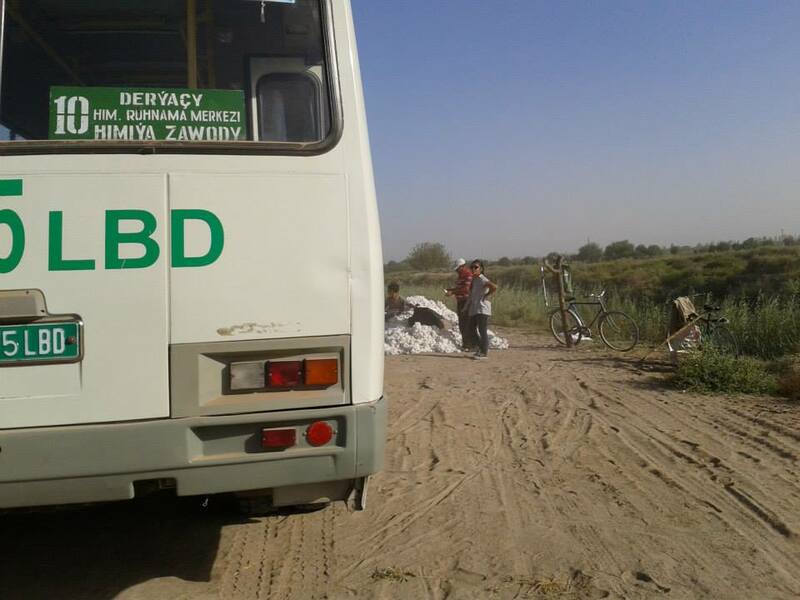 Many of the passengers were taken to the traumatology unit of the local hospital. It turned out that the driver of the truck was a young man who did not have a driver’s license. Following this incident, a new law was issued which prohibited anyone under the age of 30 from driving large trucks. We have also learned that the managers of the department, who sent their employees to the field in a truck with this driver are facing criminal charges. In the same Lebap region we know of at least one instance of someone having suffered an inflammation of lower extremities while picking cotton. An employee of municipal services returned from the cotton fields with an acute osteomyelitis. He had a prior history of a leg fracture and doctors had strictly forbidden him from putting too much weight on the leg or experiencing extreme cold temperatures. His superiors, however, disregarded doctors’ orders completely and sent him cotton harvesting for 10 days straight with overnights in a remote region of Yylangyz, where the very basic work, rest and hygienic conditions were not met. He and others initially slept on the floor of a school gym (the conditions were described in the first part of the report), but then they were moved elsewhere because of an enormous number of mice that were lurking everywhere. The land lessee decided to house people for the night directly on the fields, in yurts. Essentially, they slept directly on the sand. The sand got into their food and belongings. They washed themselves in the cold water of an irrigation ditch and they drank that very same water. A tragic accident took place on October 8th. A mother and a daughter were walking along the highway, returning home from the cotton fields. They were both hit by a car and died on the road, instantly. Kurban Bayram is a public holiday in Turkmenistan, celebrated on October 15-17 and everyone has these days off from work. However, those who harvest cotton are certain that despite the holiday they will be sent to the fields. The teachers are sent to the fields even during autumn recess.